Ask people about their favourite timeshare locations and they will invariably talk about Goa, Ooty, Munnar, Kodaikanal, Mussoorie, Darjeeling and Manali – among other popular go-to places. But there’s something we all need to keep in mind. The more popular a destination, the more crowded it will turn out to be year after year. And this can make bookings a challenge, even if you think you’re nice and early. These days it makes sense to look at locations that are not on everybody’s top-five lists. At a newer location you will find peace, quiet and freedom from crowds. Timeshare companies too, feel the need to extend their resort chain to newer geographies to give customers a wider option. Newer locations can add value to your offerings and widen the reach of timeshare in the country. They can also help create jobs and opportunities around resort locations. A: If you are one of those vacation seekers looking for newer horizons, watch this space. We plan to feature timeshare locations off the beaten track, where AIRDA members have a quiet but significant presence. This month we look at Karwar – not too far away from Goa, but with all the buzz and beach miles you could be looking for. Q: Have you thought of Karwar as a holiday destination? A: Karwar is a picture-book port town – with the Arabian Sea on one side and the imposing Western Ghats on the other, giving you a breathtaking, lush-green backdrop. During the days of maritime sea trade, Karwar was a strategic gateway for Arab, Dutch, Portuguese, French and British merchants. Karwar port also offered a safe berth during all seasons, and giving it a ring of protection from strong winds were five strategically located islands - Anjidiv, Kudumgad, Dev gad, Mogral and Shamshigudda. Karwar was also a key transit point for Indian produce brought together from the Deccan. Q: What are the main attractions in Karwar? A: Here’s what makes Karwar a vacationers’ paradise. Its scenic coastline has 24 beaches which are still largely undiscovered. More than 70% of the area has green forest cover. The Western Ghats give the region a visual charm of its own with towering rock formations, deep-gorge valleys and long stretches of hilly forest land. So there’s lots to see, lots to do, and lots to discover. Some of Karwar’s popular beaches. Devbagh Beach, Ravindranath Tagore Beach, Karwar Beach, Majali Beach Village, Tilimati Beach, Koodi Bagh Beach, Kaju Bagh Beach, Binaga Beach. Other outdoor attractions. Oyster Rock Lighthouse, Kurumgad Island, Warship Museum, Karwar Aquarium, Anashi Waterfall, Sadashivgad Fort, Guddalli Peak and Akal Gavi. 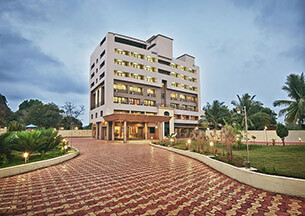 Q: Is there an AIRDA resort in Karwar? A: In Karwar, Sterling Holidays Emerald Bay is located near the “T-junction” of Kali River and the Arabian Sea, with a picture-book backdrop of the Sahyadri Mountains. Karwar Emerald Bay is a full-service Sterling Holidays resort that offers great hospitality, amazing food options and a distinctly unique location advantage that only Karwar can offer. The backwaters of the Kali River can add another interesting dimension to your holiday. Amenities at Karwar Emerald Bay. Arcade/Game Room, Full Service Health Spa & Gym. Bar, Coffee Shop, Café & Restaurant. Gardens, Picnic Area & Swimming Pool. Business Center, Internet Access & Laundry Facilities. WiFi, Travel Counter & Medical Services. There’s more information on timeshare offerings from Sterling Holidays at this link.